Larger Photo *The set shown in this photo is a prototype, the figures and color of the furniture are different that those that were sold with this set. 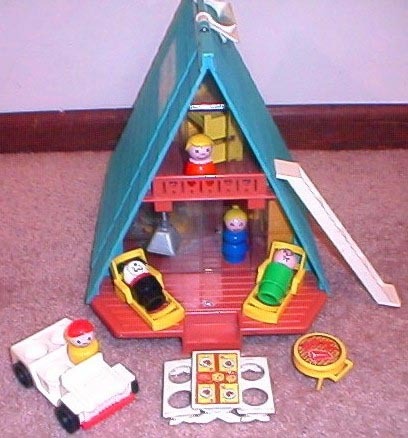 Description: A distinctively 70's phenomena, the A-Frame was a more intricately designed house than the regular #952 Play Family House--except it didn't last as long. 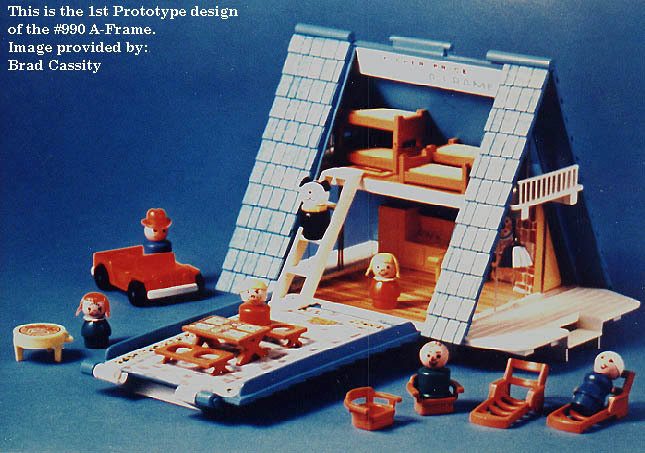 The base was one of the earliest play-and-carry Little People playsets to be constructed without wood or masonite. This Little People vacation home features a porch with one step and a clear plastic sliding "glass" door on both sides of the house and a balcony above both. A metal dinner bell hangs from a spring and rings at child's touch. The accessories used in this set are just as creative as the base. This is the first and only set that used bunkbeds, a refreshing change from the "same-o" beds used in the #952 house. 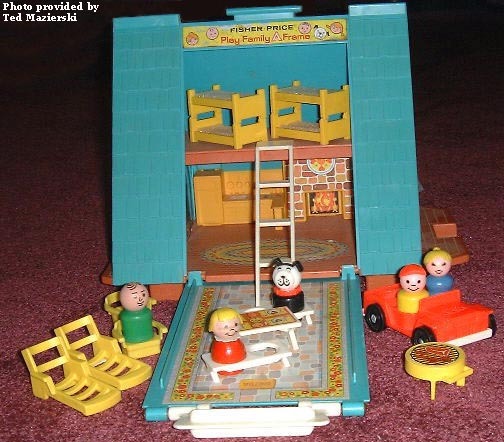 This set also features an exclusive 4-seat jeep and picnic table with benches. When it was discontinued in 1976, the picnic table and benches appeared again in green for 1980's #992 Car & Camper. The picnic table and benches were used again (minus the table litho) in 1984's #916 Zoo. B990 - Blue 2-story ski-chalet "A" Frame style house with an orange base. The front of the house has a fold-down front FLAP that hinges at the bottom. The front and back of the house have blue shingle-simulated angled walls. The 2 end sides of the house are A-shaped with a porch on the lower levels, and a balcony on the upper levels. Each lower level porch has a clear plastic "wall" with a sliding "glass" door. The balcony levels have a clear plastic "wall" with an open doorway that leads to the balcony. The right-side porch is a bit larger than the left-side porch...it includes a step up to the porch, and a bell hanging down on a spring "pole" that rings when touched. Overall size: 13-1/8" w x 8-3/8" d x 9-7/8" tall. *See "Variations" below. 2 each - FPT113 - Yellow rectangular BUNK BED TOP that has four small corner posts on the top corners and female slots on the bottom of the legs to snap on top of a bunk bed bottom. This bed was originally sold with PINK foam padding. The original foam padding tends to disintegrate over time. Size: 2-3/4" l x 1-1/2" w x 1-1/8" tall. 2 each - FPT114 - Yellow rectangular BUNK BED BOTTOM that has a slightly raised head and footboard that are flat across the top. The top four small corners have slightly raised posts with a male peg on top to place the bunk bed top piece on top of the bunk bed bottom piece. This bed was originally sold with PINK foam padding. The original foam padding tends to disintegrate over time. Size: 2-3/4" l x 1-1/2" w x 1" tall. 2 each - FPT786 - Yellow (dull yellow) plastic slatted "beach" lounge chair with short arm rests on the sides and a raised backrest (2 slats high). The bottom of the chair has a WIDE rectangular mold WITH a reinforcement rib on inner edge, click here for an example. Click here to see the difference between bright yellow and dull yellow. FPT190 - White large rectangular "picnic table" style table with a FOUR-PLACE STEAK DINNER LITHO on the surface. 2 each - FPT162 - White rectangular plastic picnic bench seat that has two round figure holes on top and two X-shaped legs on the bottom sides. FPT34 - White 5-rung ladder (including top and base). Both end steps are flat. FPT20079 - Small red top, white bottom 4-seat car/jeep. *See "Variations" below. EUWP - Yellow boy smiling, with freckles, "" eyebrows, and a red baseball cap facing forward. GMWP - Red girl with a blonde bob with bangs. HWWP - Black dog with a red collar. The collar has lines on the outside edges. FPT132 - Round red plastic "backyard BBQ" style grill with SEPARATE SPINDLE (STRAIGHT) LEGS. Has a lithograph on top of a steak, hamburger, and a hot dog. Has a small plastic handle off to one side. FPT281 - Small white top, red bottom 4-seat car/jeep. The car is flat (no sides nor roof) with a gas hole on the back corner and marked "fp" and "Fisher-Price Toys®" on the hood. The car rolls on 4 black smooth-rolling wheels with metal axles. 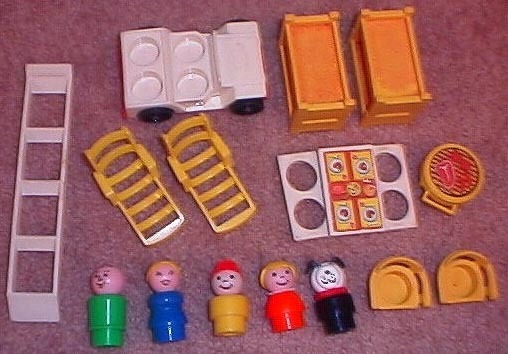 The wheels are marked "Fisher-Price Toys". *See "Variations" below. CUWP or CUPP - Orange boy smiling with red heat-stamped hair. GSWP or GSPP - Turquoise girl with a red bob with bangs. HYWP or HYPP - Black dog with a yellow collar. The collar has lines on the outside edges. 2 each - FPT150 - Small yellow plastic single-seat captain chair that has a seat back that extends 3/4 of the way around the seat with a TRIANGLE mark on back. Click here to see the difference between triangle back verses dot back chairs. Click here for a photo that shows the difference between yellow, Mustard yellow, and gold/butterscotch yellow. *See "Variations" below. White rectangular picnic table with a litho of 4 plate settings with a steak on each plate. CUPP - Orange boy smiling with red heat-stamped hair. GSPP - Turquoise girl with a red bob with bangs. B990WO - Blue 2-story ski-chalet "A" Frame style house with an orange base. The front of the house has a fold-down front FLAP that hinges at the bottom. The FLAP is a seperate part number. The front and back of the house have blue shingle-simulated angled walls. The 2 end sides of the house are A-shaped with a porch on the lower levels, and a balcony on the upper levels. Each lower level porch has a clear plastic "wall" with a sliding "glass" door. The balcony levels have a clear plastic "wall" with an open doorway that leads to the balcony. The right-side porch is a bit larger than the left-side porch...it includes a step up to the porch, and a bell hanging down on a spring "pole" that rings when touched. Overall size: 13-1/8" wide, 8-3/8" deep, and 9-7/8" tall. *See "Variations" below for A-Frame with flap still attached. F990 - Rectangular blue plastic flap that attaches to the front of the #990 A-Frame base. One side of the flap has a textured "shingled" roof pattern that matches the sides of the A-Frame. 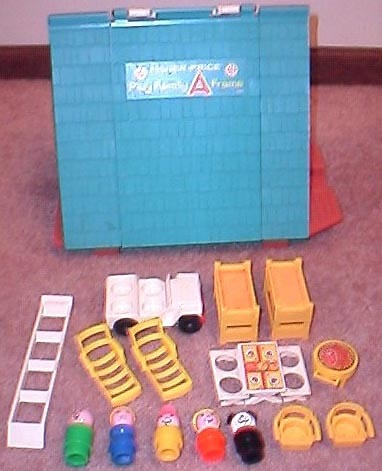 The center of the shingles has a blue paper litho marked "Fisher-Price Play Family A Frame". The other side of the flap has a large paper litho with a stone floor design and yellow trim on the sides with red flowers. One end of the litho has a light brown floor mat marked "WELCOME". The end of the flap with the "WELCOME" mat has a white plastic hinged carry handle. The handle is designed to fold under when attached to the A-Frame to make the surface flat for play. When attached to the A-Frame and folded up, the handle attaches to a peg on the tip top of the A-Frame to keep contents inside the A-Frame from falling out. The opposite end of the flap has 2 raised C-clamps (on the litho side) to attach to round pegs on the A-Frame base. Measures 10-1/8" long x 6-1/8" wide x 3/8" tall. FPT140 - Small gold/butterscotch yellow plastic single-seat captain chair that has a TRIANGLE mark on back. FPT20094 - Small mustard yellow plastic single-seat captain chair that has a TRIANGLE mark on back. 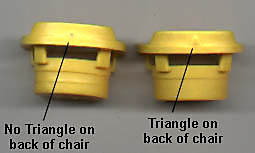 FPT150 - Small yellow plastic single-seat captain chair that has a TRIANGLE mark on back. FPT616 - Small red top, red bottom 4-seat car/jeep. 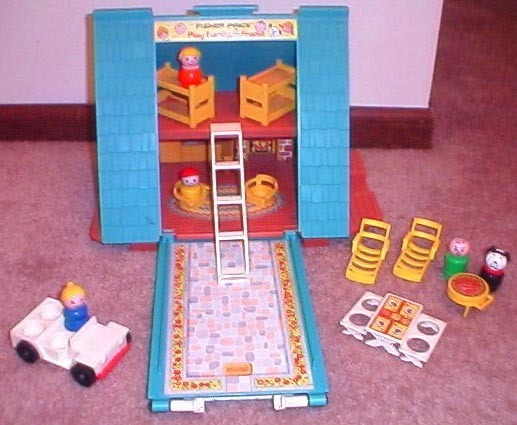 The wheels are marked "Fisher-Price Toys". FPT617 - Small red top, red bottom 4-seat car/jeep. The wheels are NOT marked. FPT20079 - Small red top, white bottom 4-seat car/jeep. The wheels are marked "Fisher-Price Toys". FPT20080 - Small red top, white bottom 4-seat car/jeep. The wheels are NOT marked. FPT281 - Small white top, red bottom 4-seat car/jeep. The wheels are marked "Fisher-Price Toys". FPT858 - Small white top, red bottom 4-seat car/jeep. The wheels are NOT marked. FPT863 - Small white top, white bottom 4-seat car/jeep. The wheels are marked "Fisher-Price Toys". FPT864 - Small white top, white bottom 4-seat car/jeep. The wheels are NOT marked.